The religion of Carthage in North Africa was a direct continuation of the Phoenician variety of the polytheistic ancient Canaanite religion with significant local modifications. Controversy prevails regarding the possible existence and practice of propitiatory child sacrifice in the religion of Carthage. However, a recent study of archeological evidence confirms this ritual. Carthage derived the original core of its religion from Phoenicia. The Phoenician pantheon was presided over by the father of the gods, but a goddess was the principal figure in the Phoenician pantheon. The system of gods and goddesses in Phoenician religion also influenced many other cultures. The supreme divine couple was that of Tanit and Baal Hammon. The goddess Astarte seems to have been popular in early times. At the height of its cosmopolitan era ( 550-300 BC ), Carthage seems to have hosted a large array of divinities from the neighbouring civilizations of ancient Rome, ancient Greece, Ancient Egypt, and the Etruscan civilization. Surviving Punic texts portray an organized caste of temple priests and acolytes performing different types of functions for a variety of prices. Priests were cleanshaven, unlike most other people. In the first centuries of the city, ritual celebrations included rhythmic dancing, derived from Phoenician traditions. Cippi and steles of limestone are characteristic monuments of the art and religion of the Punics and are found throughout the western Phoenician colonial world in unbroken continuity, both historically and geographically. The majority were set up over urns containing the ashes of sacrifices which had been placed within open-air sanctuaries. Some Carthaginian votive steles (several in Egyptian style) display a priest carrying a child; at least one has been interpreted as a living child for sacrifice. The identification of this child as living has been questioned. 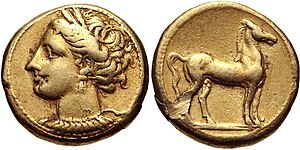 A c. 300 BC Carthaginian shekel bearing the wreathed head of the goddess Tanit and a standing horse. One of the most important stelae is the Marseilles Tariff, found in the port of Marseille but originally from the temple of Baal-Saphon in Carthage. The tariff regulated the payments to the priests for performing sacrifices and described the nature of the victims. All victims are male animals, and females are not mentioned. Porphyry (philosopher), De Abst. 2.11, states that the Phoenicians did not sacrifice or eat females. Most archaeologists supposed that infant sacrifices occurred. Lawrence E. Stager, who directed the excavations of the Carthage Tophet in the 1970s, initially believed that infant sacrifice was practiced there, and his early opinion influenced later historians. Paolo Xella of the National Research Council in Rome summarized the textual, epigraphical, and archaeological evidence for Carthaginian infant sacrifice. Some modern scholars - and currently Lawrence E. Stager himself[verification needed] - argue that evidence of Carthaginian child sacrifice is sketchy at best and that these reports are more likely to have been a Roman libel against the Carthaginians to justify their conquest and destruction. Tertullian, about 200 CE, states that although the priests who sacrificed children had been crucified by a Roman procurator, "that holy crime persists in secret". Cleitarchus, Diodorus Siculus and Plutarch all mention burning of children as an offering to Cronus or Saturn, that is to Bal Ammūn, the chief god of Carthage. According to Justin, the Carthaginians accepted the Persian Achaemenid Empire's instructions to stop sacrificing children (and eating dogs). The hands of the statue extended over a brazier into which the child fell once the flames had caused the limbs to contract and its mouth to open... . The child was alive and conscious when burned... Philo specified that the sacrificed child was best-loved. According to Stager and Wolff, there is a consensus among scholars that Carthaginian children were sacrificed by their parents, who would make a vow to kill the next child if the gods would grant them a favor: for instance, their shipment of goods were to arrive safely in a foreign port. However, some historians have disputed that child sacrifice occurred, suggesting instead that the tophets were resting places for the cremated remains of children that died naturally. Sergio Ribichini has argued that the Tophet was "a child necropolis designed to receive the remains of infants who had died prematurely of sickness or other natural causes, and who for this reason were "offered" to specific deities and buried in a place different from the one reserved for the ordinary dead". The few Carthaginian texts which have survived make no mention of child sacrifice (very few mention religion at all). Child sacrifice may also have been overemphasized for effect; after the Romans finally defeated Carthage and totally destroyed the city, they engaged in postwar propaganda to make their archenemies seem cruel and less civilized. "Tophet" is a term derived from the Bible, used to refer to a site near Jerusalem in which Canaanites and Israelites sacrificed children. It is now used as a general term for all such sites with cremated human and animal remains. The Hebrew Bible does not specify that the Israelite victims were buried, only burned although the "place of burning" was probably adjacent to the place of burial. It is not at all known how the Phoenicians themselves referred to the places of burning or burial or to the practice itself. Several apparent "Tophets" have been identified, chiefly a large one in Carthage, dubbed the "Tophet of Salammbô" after the neighbourhood where it was unearthed in 1921. Soil in the Tophet of Salammbó was found to be full of olive wood charcoal, probably from the sacrificial pyres. It was the location of the temple of the goddess Tanit and the necropolis. Animal remains, mostly sheep and goats, found inside some of the Tophet urns strongly suggest that this was not a burial ground for children who died prematurely. The animals were sacrificed to the gods, presumably in place of children (one surviving inscription refers to the animal as "a substitute"). It is conjectured that the children unlucky enough not to have substitutes were also sacrificed and then buried in the Tophet. The remains include the bodies of both very young children and small animals, and those who argue in favor of child sacrifice have argued that if the animals were sacrificed, then so too were the children. The area covered by the Tophet in Carthage was probably over an acre and a half by the fourth century BCE, with nine different levels of burials. About 20,000 urns were deposited between 400 BCE and 200 BCE, with the practice continuing until the early years of the Christian period. The urns contained the charred bones of newborns and in some cases the bones of fetuses and 2-year-olds. These double remains have been interpreted to mean that in the cases of stillborn babies, the parents would sacrifice their youngest child. There is a clear correlation between the frequency of deposition of child remains and the well-being of the city. [further explanation needed] In bad times (war, poor harvests) sacrifices may have become more frequent, indicating an increased assiduousness in seeking divine appeasement or possibly a population-controlling response to the reduction of available food or perhaps increased child mortality from famine or disease. A detailed breakdown of the age of the buried children includes pre-natal individuals, stillbirths. It is also argued that the age distribution of remains at this site is consistent with the burial of children who died of natural causes, shortly before or after birth. Sergio Ribichini has argued that the Tophet was "a child necropolis designed to receive the remains of infants who had died prematurely of sickness or other natural causes, and who for this reason were "offered" to specific deities and buried in a place different from the one reserved for the ordinary dead". He adds that this was probably part of "an effort to ensure the benevolent protection of the same deities for the survivors." However, that analysis is disputed; Patricia Smith and colleagues from the Hebrew University and Harvard University show from the teeth and skeletal analysis at the Carthage Tophet that infant ages at death (about two months) do not correlate with the expected ages of natural mortality (perinatal). Sites within Carthage and other Phoenician centres such as Motya, near Sicily, revealed the remains of male children under the age of five. There was no evidence of disease in the bones that survived cremation. Tophets have been also found in Sardinia at Sulci, Nora, Monte Sirai, Tharros and Bithia. ^ "Carthaginian Religion". Ancient History Encyclopedia. Retrieved 8 August 2017. ^ "Tanit | ancient deity". Encyclopedia Britannica. Retrieved 8 August 2017. ^ Houston, Walter (1993). Purity and Monotheism: Clean and Unclean Animals in Biblical Law. Bloomsbury Publishing. ISBN 978-0-567-07190-3. , p. 153. ^ Dommelen, Peter van; Melchiorri, Valentina; Quinn, Josephine; Xella, Paolo (2013). "Cemetery or sacrifice? Infant burials at the Carthage Tophet: Phoenician bones of contention". Antiquity. 87 (338): 1199–1207. doi:10.1017/S0003598X00049966. ISSN 1745-1744. ^ Brown 1991, p. 22–23. ^ a b Stager, Lawrence; Samuel. R. Wolff (1984). "Child sacrifice in Carthage: religious rite or population control?". Journal of Biblical Archeological Review. January: 31–46. ^ Fantar 2000, p. 28-31. ^ Macchiarelli, R.; Bondioli, L.; Houghton, F. D.; Schwartz, J. H. (2012). "Bones, teeth, and estimating age of perinates: Carthaginian infant sacrifice revisited". Antiquity. 86 (333): 738–745. doi:10.1017/S0003598X00047888. ISSN 1745-1744. ^ a b Stager 1980, p. 3. ^ Stager 1980, p. 6. ^ Ribichini 1988, p. 141. ^ Avishai, Gal; Greene, Joseph A.; Stager, Lawrence E.; Smith, Patricia (2013). "Cemetery or sacrifice? Infant burials at the Carthage Tophet: Age estimations attest to infant sacrifice at the Carthage Tophet". Antiquity. 87 (338): 1191–1199. doi:10.1017/S0003598X00049954. ISSN 1745-1744. Brown, Susanna Shelby (1991). Late Carthaginian Child Sacrifice and Sacrificial Monuments in their Mediterranean Context. JSOT/ASOR Monograph Series. 3. Sheffield Academic Press. ISBN 1850752400. Fantar, M'Hamed Hassine (November – December 2000). Archaeology Odyssey. pp. 28–31. Greene, Joseph. Punic Project Excavations: Child Sacrifice in the Context of Carthaginian Religion: Excavations in the Tophet. American Schools of Oriental Research. Ribichini, Sergio (1988). "Beliefs and Religious Life". In Moscati, Sabatino (ed.). The Phoenicians. ISBN 0896598926. Stager, Lawrence (1980). "The Rite of Child Sacrifice at Carthage". In Pedley, John Griffiths (ed.). New Light on Ancient Carthage. University of Michigan Press. ISBN 0472100033. Stager, Lawrence E.; Wolff, Samuel R. (January – February 1984). "Child Sacrifice at Carthage: Religious Rite or Population Control?". Biblical Archaeology Review.